Description: I will not lose another person I love. I will not let history repeat itself. Vincent waited lifetimes to find me, but in an instant our future together was shattered. He was betrayed by someone we both called a friend, and I lost him. Now our enemy is determined to rule over France s immortals, and willing to wage a war to get what they want. It shouldn’t be possible, none of it should be, but this is my reality. I know Vincent is somewhere out there, I know he s not completely gone, and I will do anything to save him. After what we’ve already fought to achieve, a life without Vincent is unimaginable. He once swore to avoid dying - to go against his nature and forsake sacrificing himself for others - so that we could be together. How can I not risk everything to bring my love back to me? This review contains spoilers that have been hidden. Highlight the text to view spoilers. 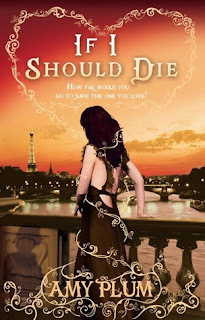 If I Should Die is the final book in Amy Plum’s Revenants trilogy. Once again this tale of love, death and immortality delves into the romantic and history filled world of the Revenants. This series has been a pleasure to read, with its unique take on supernatural people. The final instalment sees the return of beloved characters and gives them a wonderful farewell that is full of possibility. This book picks up where the massive cliffhanger left us in Until I Die. Vincent and Kate have been separated, and the book concentrates on finding a solution to their dilemma and bracing for a final showdown with the Violette. I found that there were two distinct parts of this book. There was the first half of this book, which focused on finding a solution to the cliffhanger. This part of the book was a little less action packed and slower paced. It took me awhile to get into the story. The second half is where this story gets interesting and the action all comes to a head culminating in an epic showdown. Questions pertaining to the champion and prophecy are resolved. The setting of this book is wonderful. I love how Plum brings Paris to life with her writing. It is truly the perfect setting for a tale about death and romance. Another highlight of this book is the relationships between the Kindred that Plum has built into this story. They are one big family and the love between them is clear. Kate is a great heroine. She gets thrust into some bleak situation, and she embraces the pain and pushes through. She is the hero of her own story, and doesn’t need anyone rescuing her. Vincent is a gentleman and a leader. The romance between Kate and Vincent is just as sweet in this story. You can see how much these two are willing to sacrifice to be together. We get to see more of Kate’s family as they play a larger role in this book. Despite a few issues, If I Should Die is a fitting end to a good series. Its ending is filled with possibility and leaves lots of blanks for the readers to fill in. If you haven’t read this series, I recommend picking it up. Great mythology, history and romance. I agree about the spoiler. It was just too convenient for them, just like the fact that Vincent was brought back to life and stuff like that. I disliked this book a lot, so I'm happy you enjoyed it more than I did :) Great review.